By: Breonna Fleming, Dionne Wallace, Naela Jones, Kaelyn Burke, Klevir Winston, Ja’Sahi Matthews and Dha’kira Williams. Edited by Cordé Shaw. JAN. 23, 2018: On November 2, 2018 our FNN team went to the Japan Information and Culture Center, Embassy of Japan (JICC) in Washington, DC. It was fun to learn new things about the Japanese culture. We learned that Japan is far away from Washington D.C. and that their culture is very different. Julia Ford, Educational Program Coordinator, gave us the tour. She showed us how the Japanese fold paper. It is called Origami. Origami is made of geometric shapes. 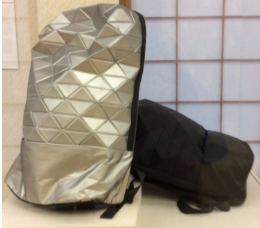 We saw a backpack made from an Origami design that is cool. We saw a deployable solar array that was folded using Origami design that was made out of solar panels. They put the solar panels in a rocket ship and sent it to outer space. 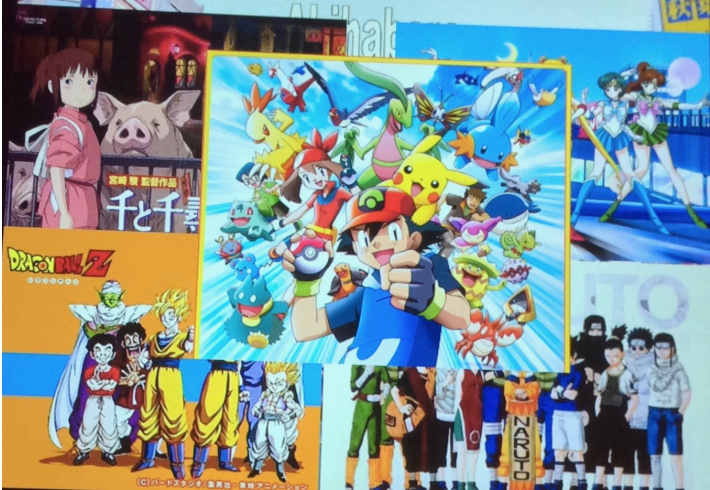 Next, we went into a theater where Julia gave us a lot more information about Japan. Julia showed us how to pick up food using chopsticks. Dionne Wallace was able to pick up some food, but it was hard because it was her first time trying to use chopsticks. We think it is fun trying to pick up food with the chopsticks. Julia put Japanese clothes on one of our team members, Klevir. It looked like a robe, but it was wrapped with a sash and had a big bow on the back. Then Julia showed us a robot that was shaped like a seal. It was a personal robot named PARO. PARO has five senses. It reacted to touch, the sight of the lights and has feeling. It also has a gyroscope to sense posture. Check it out at http://www.parorobots.com Next Julia showed us a game. It looked easy but when we tried it, it was very very hard.We liked how you could swing the ball into the air and make it land in the cup. It might have been hard, but we still had lots of fun. 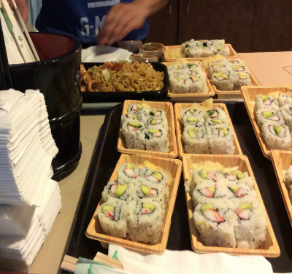 After we left JICC, we went to a restaurant called Sushi Express on K Street, NW to try some traditional Japanese food. 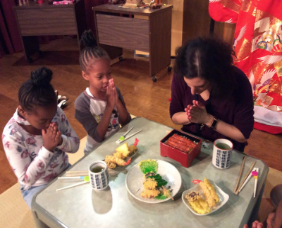 We tried Shrimp Tempura and Sushi, but some people did not like Sushi. Arriana said that Sushi wasn’t the worse thing she had tasted, but it was not the best. Breonna also liked the Sushi because it was different and new to her. Our trip was fun because we learned a lot about the Japanese cultural. Cordé would like to go to Japan to learn how to create Anime characters. Arianna would like to start using chopsticks more, then use them more and more to eat. Breonna Fleming, Dionne Wallace, Kaelyn Burke, Klevir Winston, Ja’Shai Matthews, Naela Jones, and Dha’kira Williams are 3rd grade scholars and Cordé Shaw is a 5th grade scholar at Friendship Southeast Academy.